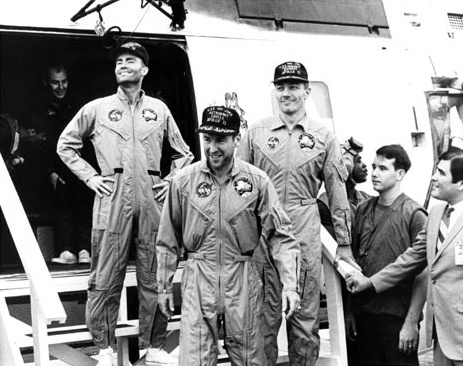 Apollo 13 was the seventh mission of NASA's Project Apollo and the third manned lunar-lander mission. The flight was commanded by Jim Lovell. The other astronauts on board were Jack Swigert and Fred Haise. The craft was launched successfully toward the Moon, but two days after launch a faulty oxygen tank exploded, and the Service Module became damaged, causing a loss of oxygen and electrical power. There was a very large chance that the astronauts would die before they could return to Earth. They were very short of oxygen. Oxygen is not just used to breathe, on the Apollo spacecraft it was used in a device called a Fuel cell to generate electricity. So they conserved their remaining air by turning off almost all their electrical equipment, including heaters. It became very cold in the spacecraft. In order to stay alive the astronauts also had to move into the Apollo Lunar Module and make it work as a sort of "lifeboat". When they approached the Earth they were not sure that their parachutes, needed to slow the Command Module down, would work. The parachutes were thrown out by small explosive charges that were fired by batteries. The cold could have made the batteries fail, in which case the parachutes would not work and the Command Module would hit the ocean so fast that all aboard would be killed. Apollo blasted off on the 11th April 1970 at 19:13 UTC from Cape Canaveral and went into temporary low Earth orbit. Two hours later they fired the rocket motor again to go toward the Moon. They wanted to land at Fra Mauro. Despite the hardships, the crew made it back to Earth. Though the crew did not land on the Moon, the flight became very well known. Some people regarded it as a failure because they did not land on the Moon. However, others thought it was possibly the National Aeronautics and Space Administrations' (NASA's) greatest accomplishment in returning three men in a very damaged spacecraft back to Earth safely. Coming up to re-entry, it was thought that the electrical equipment would short circuit because the water in the astronauts' breath had turned back into a liquid all over the computers. However, the electronics were fine. 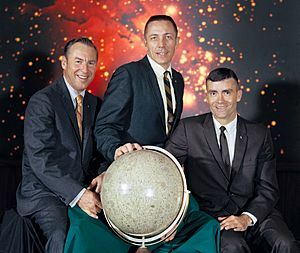 Books were written about the event, including one by Jim Lovell, the commander of the mission. A movie was also made about it, directed by Ron Howard and starring Tom Hanks. A Direct Abort return, depicted in a 1966 planning report. The trajectory shown is at a point much earlier and farther away from the Moon than where the Apollo 13 accident happened. Apollo 13 Facts for Kids. Kiddle Encyclopedia.